Based in Loreto, Peru, Aqua Expeditions is the fulfillment of CEO Francesco Galli Zugaro's longtime ambition. Previous experience working with a Galapagos Islands tour company gave him the experience and expertise he needed to found Aqua Expeditions and introduce passengers to the remote region of Peru's Amazon River. A few years later he added Southeast Asia to the line's itineraries. Founded in 2007, the two-ship line operates year-round, sailing three-, four- and seven-night cruises from Iquitos, Peru; Siem Reap, Cambodia; Phnom Penh, Cambodia; and Ho Chi Minh City, Vietnam. Committed to sustainable tourism, the company has vowed to leave as small a footprint as possible while introducing visitors to the Amazonia and Mekong regions. Its practices include careful monitoring of emissions, waste management and fuel efficiency, as well as safe-food and water-purification protocols. Public rooms include an indoor bar and lounge, an observation deck, an outdoor lounge, a spa, a boutique and a dining room. Meals feature local ingredients and flavors, and select wines and beers are included with supper. Naturalists onboard speak English; daily excursions are included. 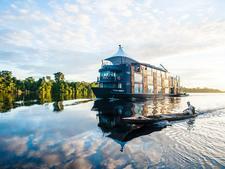 Aqua Expeditions attracts well-heeled, seasoned travelers looking for unique experiences. Most are retirees. Oddly, for a cruise company that emphasizes luxury and adventure, the line is relatively welcoming to families (the minimum age to sail is 7). Each ship has several connecting staterooms for larger family groups, and guides take care to engage children during daily excursions. Of course, there are no facilities specifically for children, but families interested in the remarkable ecosystem and culture of the Amazon or the Mekong will be welcomed and accommodated. Peruvian architect Jordi Puig designed Aria Amazon, which debuted in April 2011, in the style of a contemporary boutique hotel. The vessel features 16 suites with enormous picture windows and accommodates 32 passengers. The 24 crew members include four English-speaking naturalist guides who introduce passengers to the flora and fauna of the rainforest. The ship was refreshed in 2015 with new decor in the spa, upgraded bed linens and updated lighting. The 40-passenger Aqua Mekong was built in 2014 and boasts 20 suites, including eight with balconies; all have floor-to-ceiling windows for continual views of the landscapes passing by. The sleek interiors were designed with local materials whenever possible. Aqua Expeditions' original ship, the 24-passenger Aqua Amazon, was in service from 2007 to 2016, when it sank following an explosion during turnaround hours. Seven-night cruises begin and end in Iquitos on Friday (Aria) and Sundays (Aqua), and each of the three-, four- and seven-night itineraries vary, depending on whether it's high-water season or low-water-season. 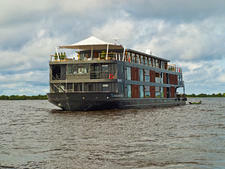 Three night cruises end in -- and four-night cruises begin in -- Nauta, near the origin of the Amazon River. Port stops include visits to local villages for rainforest walks, nighttime skiff trips to find caiman (jungle alligator-like reptiles), forays to hunt for anacondas and piranhas, and the occasional picnic lunch off the boats.